Yeah, it’s my final day on the $2 a day challenge. And I feel like celebrating. I woke this morning feeling happy – my final day, I have almost done it! Mind you, I still had a few hurdles to pass including morning tea. My Division is famous for its fortnightly morning tea. It has a roster system, and people take it very seriously. My workmates to a lot of trouble to bake, or order sausage rolls, or put together a cheese platter. I stood and mingled for a bit, and politely declined sausage rolls, gluten free cake (looked really yummy) and crackers on the cheese plate. I put a poster up, and several of my colleagues donated to my cause. They were quite generous, actually. They must have felt sorry about eating in front of me. Breakfast was porridge (again). It might not be original, but it is filling and a little goes a long way. Lunch was leftover fettuccine with butter and breadcrumb sauce. 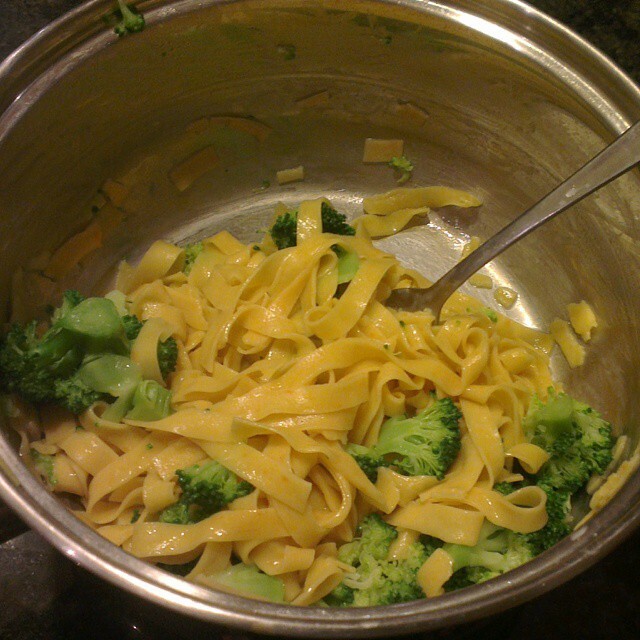 I had some soup for afternoon tea, and then fettuccine tossed with broccoli and butter for dinner. I had planned to be more adventurous for dinner, thinking I would make broccoli crepes or something. But I was tired, lazy and just happy to eat leftovers. I was still hungry after dinner, though, and briefly thought about cooking. But then I figured I could just wait until midnight, when I could eat. Which is pretty much what I am doing as I type this. I have done a few things to distract my hunger pains, including having a luxurious candle-lit bath, but mostly I am waiting to eat. So what will I splurge on now that the challenge is over? People at work have been asking me this all day, and I don’t really have an answer. Right now I would like a cup of tea, although perhaps the caffeine is not a good idea at midnight. And perhaps some of those M & Ms that my boys were snacking on (in moderation) earlier. Some toast will probably hit the spot, though, as it is quick, easy and filling. Thank you to everyone for your support. It has been an amazing week, and has shown me what you can do with persevere and willpower. With your sponsorship of the Live Below the Line Challenge I have exceeded my modest goal of raising $250 – the current tally is $315. Thank you so much for your encouragement through this journey. Good work getting through the challenge!!! Thank you (I’m blushing now).